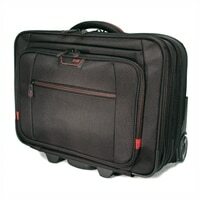 Mobile Edge Professional Overnight Rolling 13-inch to 17.3-inch Laptop Case - Laptop carrying caseThis Professional Rolling Laptop Case offers four separate storage sections for all of the gear you need for your daily commute or an overnight trip. This full-featured rolling case is constructed from durable ballistic nylon and includes a five-stage telescoping handle, a padded top carry handle for easy lifting, free-rolling in-line skate wheels and a trolley strap for stacking on other luggage. The roller also features a fully-adjustable and padded laptop compartment for 13-inch to 17-inch laptops, a separate fleece lined pouch for an iPad, tablet or e-reader, a large file section and an oversized compartment to hold clothing and personal items. A zippered front organizer section provides quick access to pens, cell phone, business cards, keys, cables and other small accessories. The matching Professional Backpack offers generous amounts of organized storage and fits security on top of the rolling case with its built-in trolley strap. This Professional Rolling Laptop Case offers four separate storage sections for all of the gear you need for your daily commute or an overnight trip. This full-featured rolling case is constructed from durable ballistic nylon and includes a five-stage telescoping handle, a padded top carry handle for easy lifting, free-rolling in-line skate wheels and a trolley strap for stacking on other luggage. The roller also features a fully-adjustable and padded laptop compartment for 13-inch to 17-inch laptops, a separate fleece lined pouch for an iPad, tablet or e-reader, a large file section and an oversized compartment to hold clothing and personal items. A zippered front organizer section provides quick access to pens, cell phone, business cards, keys, cables and other small accessories. The matching Professional Backpack offers generous amounts of organized storage and fits security on top of the rolling case with its built-in trolley strap.